A new year has begun which always has me thinking toward the future. 2018 went by in a flash. I think I blinked and it was already November. Personally, I always feel hopeful and excited for each new year and fresh start that comes my way. While I’m not much of one to come up with New Year’s Resolutions, I do like to work towards certain things each year. In terms of traveling, there are always certain places we hope to go and things to see each year. This travel year is shaping up to be a bit different in that we already have one major trip fully planned, another trip about half planned, and only anticipate taking one more before the year is up. Planning far in advance has many benefits but it also doesn’t leave much opportunity for spur of the moment bookings like we have done in the past. 1) Have a wonderful first time experience in Southeast Asia! 2) Finalize destinations and our itinerary for our second trip which is already half planned. We have the plane tickets and some ideas in our heads. The rest is still up in the air! 3) Return to the beach. It’s been awhile since we’ve enjoyed a laid back, hot, salty air-filled beach vacation. 4) Find a quick and easy weekend getaway we can enjoy mid-year. Because we are aiming for three big trips this year (and we have to properly manage our vacation balances at work), I’m hoping we can find someplace new and exciting to visit for a few days during one of 2019’s long weekends. As with most years, we are pretty open to whatever travel opportunities come our way. Most things are planned for the year, we are still open for whatever we end up doing, I’m excited and grateful we have the opportunity to get out there! When thinking about what I’d like to do with By Land and Sea this year, the list seems never-ending. There is so much to learn about and do in the world of blogging! I started this blog three years ago as a way to catalog our adventures – share photos, remember details and itineraries, tell our stories, and connect with and inspire other like-minded people. I intend to continue doing this, but to also grow my blog and other personal interests in 2019. In conjunction with our love of travel, I’m also looking forward to sharing more on my other passions and how they intertwine with travel through creative storytelling style posts. As always, I’d like to ask my readers to consider booking hotels for any upcoming stays you might have through our Booking.com link. It’s no additional cost to you, but helps us offset the cost of running this blog. Just click below! I’m also very excited to announce that I will begin teaching some classes about travel, sustainable tourism, and all sorts of other tourism-related considerations at a community college this year! This stems from receiving my Master’s degree in Sustainable Tourism. And YES, I will be incorporating more and more of this into the blog soon. Let’s just say that after completing grad school, I needed a bit of time to rest, decompress, and process. 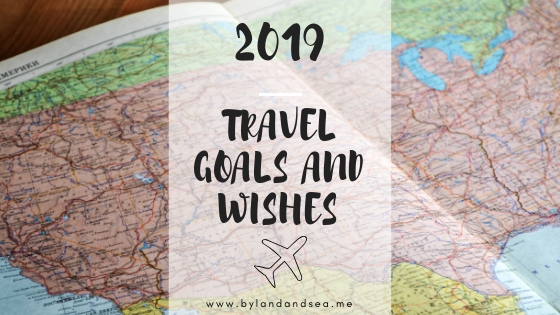 What are your travel goals and wishes for the new year? Tell us about them in the comments below! P.S. This post contains affiliate links. If you click on one and make a purchase, I might make a little extra spending money, at no extra cost to you. As always, all opinions are my own. Beautiful picture of the zinnias – just the lift I needed on this snowy day! Always enjoy your blogs and look forward to the next ones. Aren’t those flowers pretty? They were surrounded by butterflies!! Glad you enjoy my posts – thanks for reading and commenting. Your post inspires me! I’m a planner and I do not do well with spur-of-the-moment opportunities. I’d like to be more flexible with that! I’ll look forward to reading about your 2019 travels! Thanks Sharon! Happy travels to you as well – I hope you have some great things planned! I would love to hear more about sustainable tourism! That sounds like such a fascinating degree to get and such an important topic. Thank you! It really is an amazing topic and concept. I’m so glad I pursued it! Yes Angie! I’m pretty sure at some point we will meet up. If not by chance, then through some planning. We need to make this happen!! Great goals, I am heading to the beach myself and cant wait! Have a great time! Where are you headed too? !